In the last few years, Austin, Texas has become a hotbed for far-left extremist activity. 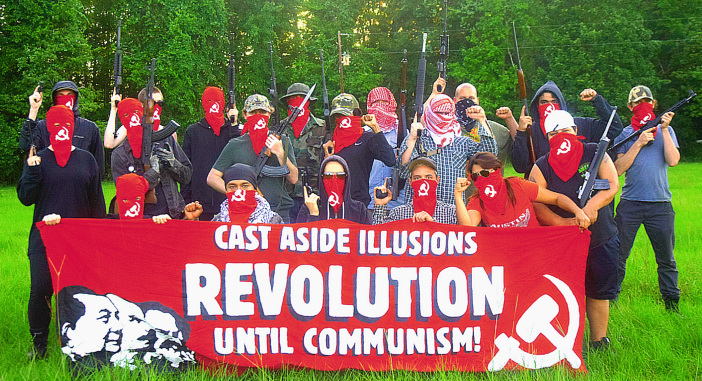 One of the most active groups in the region is the communist militia group, Red Guards Austin. As we have previously reported, this “anti-fascist” group adores communist mass murderer Mao Zedong, routinely holds armed demonstrations, and openly calls for a violent armed revolution against the capitalist system. As is common with leftist movements, a small cadre of devoted activists will often times organize under multiple banners in order to amplify their message and diversify their recruiting efforts. A few other local organizations that appear to share core membership and strategic goals with this militia group are Serve The People – Austin, Defend Our Hoods – Austin, and Revolutionary Student Front – Austin. The goal of every initiative and program launched by a revolutionary organization should be for the purpose of recruiting fighters into its ranks and forging them in the fiery furnace of class struggle. Orienting recruitment toward those suffering from qualitatively more intense mental illness, a population whose conditions in general serve as barriers to reaching the point of being continuous fighters (we say “in general” because many of the best organizers in the revolutionary movement and our organization also suffer from these conditions) does not accomplish the task of drawing from the most advanced sections of the people. To be an effective revolutionary, a skilled writer cannot devote themselves merely to writing—they must also learn to speak well, punch hard and shoot well, work hard, design propaganda, communicate well with others, and so on. Call the FBI HQ at (202) 324-3000 and make sure they know there is an Austin based extremist group openly advocating for political violence at UT-Austin. Call the UT-Austin Campus police department at 512-471-4441 or submit an anonymous tip. Again, make sure they know there is an Austin based extremist group openly advocating for political violence at UT-Austin and make sure to include this archived version of the document outlined above as well as the link to our full report.